After a hiatus of a year, Armed Forces Day will be marked on February 21, 2012, and will become a permanent feature of the national calendar. The 2010 Armed Forces Day event was held in Thaba Tshwane on December 16, when President Jacob Zuma addressed a gathering of serving and retired soldiers, with representatives from various veterans organisations also present. 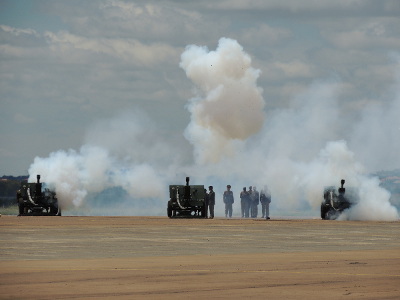 A planned flypast and demonstration of military equipment and skills at the Thaba Tshwane sports grounds had to be cancelled because of bad weather. At that time the South African National Defence Force (SANDF) head of communications Siphiwe Dlamini said the intention was to make the day a permanent feature of the national calendar. 2011 went by without any Armed Forces Day and last year indications were that the SS Mendi memorial service would be the major event alongside the centenary of the South African Army. This also did not happen with the exception of the memorial service. “I can confirm February 21 will this year officially be Armed Forces Day,” said Brigadier General Xolani Mabanga, SANDF corporate communications director. Events on that Thursday February 21 will start with a commemorative service at the SS Mendi memorial in Atteridgeville, Pretoria. Zuma, in his capacity as commander-in-chief of the SANDF will attend and lay a wreath, Mabanga said. An amended brigade parade is set to be the second component of the day. “The exact venue has yet to be decided but it will in Pretoria and the parade will be representative of the entire SANDF. It will also include a flypast of SAAF aircraft. “The third and final component of the day will at the same venue and will take the form of a celebration of South Africa’s military with demonstrations, air drops and other military activities,” he said.